Memorial Day Weekend marks the unofficial start of summer and the beginning of vacation season. 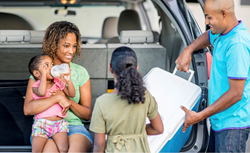 That’s why Amica Insurance is sharing tips to make sure your family and vehicle are ready to hit the road this weekend. If traveling for Memorial Day Weekend, plan a route ahead of time by checking the weather, road conditions and traffic. According to an estimate from the National Safety Council, there may be 439 deaths and an additional 50,500 serious injuries from motor vehicle crashes during the three-day Memorial Day holiday period. These numbers reflect a recent trend in increased traffic fatalities due to a stronger economy and lower gas prices, reports the Council. Check the tire pressure, tread wear and the spare. This is especially important if traveling in a 12- to 15-person passenger van, 57 percent of which typically have at least one significantly underinflated tire. Make sure windshield wipers work, and replace worn blades, if necessary. Also, fill up the wiper fluid reservoir. Keep up with routine maintenance and tune-ups. Have the vehicle checked for leaks, worn hoses or other necessary parts, repairs and replacements. Plan a travel route ahead of time by checking the weather, road conditions and traffic. Leave early, allowing plenty of time to reach the destination. Always wear a seatbelt, whether driving or riding along as a passenger. Children under the age of 13 should sit in the back seat. Never drink and drive, and avoid distractions like texting. Stay focused and alert at all times.